Many people have a distinguishing feature, something that sets them apart from others and makes them almost instantly familiar or recognizable. Someone who spends a good part of their time in the public eye is even likelier to possess this kind of trait, especially an actor who has performed many times in front of the camera. In the case of Lee Hayden (Sam Elliott), it’s not just one thing but rather two. 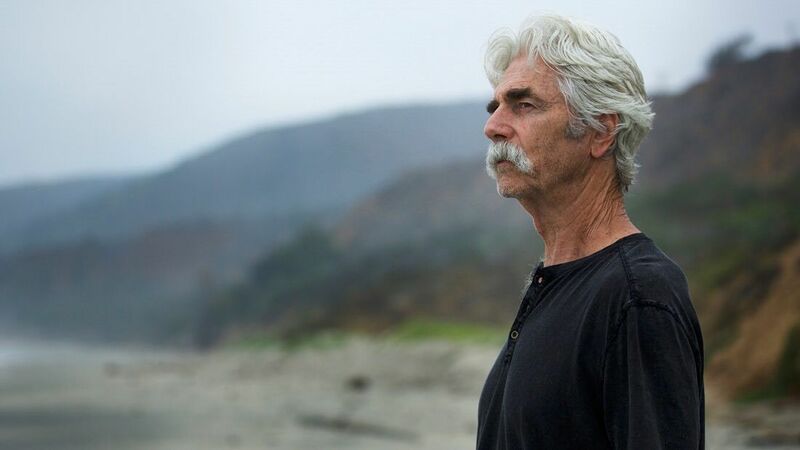 The veteran actor is well-known for his low, booming voice that anyone listening finds mesmerizing, and his vocal impact is matched by the intensity of his facial hair, a thick mustache that frames his long face. Lee is not a man who lives a terribly exciting life. After a lengthy career, the highlight of which was the title role in a Western film that lingers in his memory, Lee now has considerable trouble getting work. Most of his time is spent doing endless takes of commercials in which his voice helps to sell meat products, and his only friend is Jeremy (Nick Offerman), an old costar who has become his drug dealer. The discovery of detrimental news about his health coincides with a newfound relationship with a much younger stand-up comic, Charlotte (Laura Prepon), and a long-delayed attempt at rebuilding a fractured dynamic with his daughter Lucy (Krysten Ritter). Elliott is a formidable actor who has been working regularly for the past three decades. This reviewer remembers him most fondly from his humorous recurring role as Eagleton Ron on “Parks and Recreation” and also appreciated his performance around the same time in a far more villainous role on “Justified.” At the age of 72, Elliott is perfectly primed for this kind of part, one that reflects back upon a career with some similarities to his own, though with a far more melancholy downturn. It’s a fantastic performance that should earn him well-deserved accolades. Appearing alongside Elliott in this endearing comedic drama, Prepon, who now spends most of her time on “Orange is the New Black,” is an affirming foil. Offerman, offering typical comic relief, is a delight, and the typically excellent Ritter offers her best portrayal of resentment in a small role. Elliott’s real-life wife Katharine Ross appears as his ex-wife, adding a nice personal touch to a story that isn’t overwhelmingly original but still feels sincere and honest, bolstered by a tremendous lead performance.